Developed to meet the needs of Dynamics GP users, CRG Re-Formatter™ is the only tool currently available to help companies quickly & easily modify the account framework of Microsoft Dynamics GP™. Re-Formatter seamlessly reformats the Account Framework instantaneously altering the format of all data. Have you outgrown your current GP chart of accounts? Has organizational restructuring rendered it obsolete? Are you trying to import data from another GP install with a different framework? Get a Free Trial of Re-Formatter! Re-Formatter is the ONLY solution available to modify the account framework in GP after the initial installation. 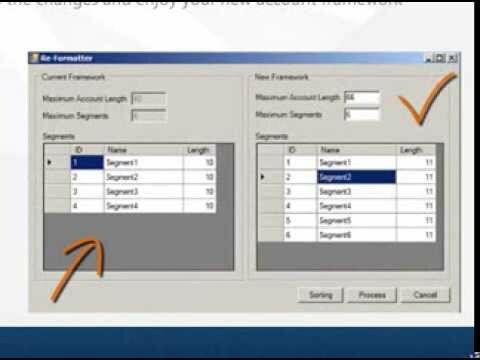 As you know, your account framework in Dynamics GP is created upon initial install and cannot be altered after set-up. CRG Re-Formatter offers the freedom to modify your account framework anytime as the needs of your organization’s financial system changes. With a few simple steps, Microsoft Dynamics GP users can transform their “old” data format into a “new” and improved account framework. View the brochure. "I have used CRG Changer and Re-Formatter for many years for various companies. CRGroup always makes a good solid product that works, and works well. I appreciate knowing that I can count on the product to do what I need done without a lot of fuss and extra effort. Thanks for making my life easier." "I love CRGroup for making Re-Formatter and CRG Changer because it has made the life of the accounting teams at our client sites, better! Re-Formatter helped us change over a large NFP very quickly, which let them line up segments to programs. It was a great experience for all!" You can take the benefits of CRG Re-Formatter even further by using it alongside CRG Changer. Many clients use Re-Formatter to expand their account frameworks and then use CRG Changer to merge and/or change GL accounts, vendor and customer ID’s, item numbers, and employee ID’s – ensuring their financial systems are up to date and formatter to suit their growing needs.